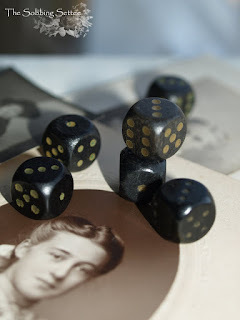 Just love these little black dice ... I often hold them in my hands and just play with them. I just like the way they feel in my hand. As I'm writing this down it just sounds like a weird habbit to me. Do you think it's weird? This beauty arrived just in time to join this party today. I just could have kissed the mailman yesterday morning ...come to think of it ... he is rather cute. 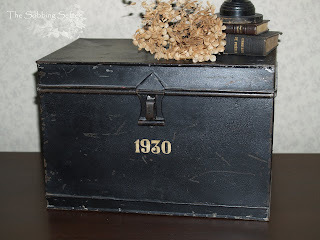 Anyway, this black metal container was used in church to store candles in. That's it for this Friday. Can't wait for next weeks party! 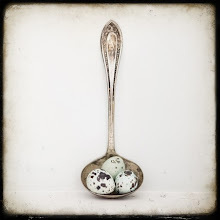 Please go and check out Gypsy Brocante for more VBF contributions or even join in the fun! Oh, wow, how cool is that box!!! Wat een schitterend blik heb je daar. Ik ben weg van dat soort blikken. En die dobbelstenen zijn ook mooi. Niet van die gladde witte maar deze zijn echt mooi. Speel daar maar rustig mee. Erg mooie bijdrage vind ik het, en de rollende stenen in je hand hebben iets magisch, een soort verbondenheid met??? Helemaal niet raar hoor, lekker laten rollen. Het blik uit 1930 is een beautie! Oh yes, I love your black box as well! and the dice are very cool! I love the dice - I totally get why you like to hold them in your hand. Texture is everything. It's the same as holding a stone or worry beads. I love that box - Fabulous! Hi! I'm new here! Your blog is lovely. So glad to have found your blog! It's simply awesome! Hey and there's nothing wierd about loving you vintage stuff...whenever I decorate for the holidays and bring out vintage pieces that I only see once a year...I've been caught, and yes this is true..waving hello to them If they make you happy so why not smile and wave? 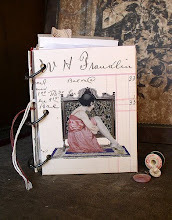 I just love your photos and your beautiful treasures. The black dice are wonderful and the small chest is divine!! You are right.. the mailman was very clever in his timing and I am grateful. Well I don't think there is anything weird about rolling the dice in your hands. It is a very medatative process. I like little bit of dark colours in your pictures...black friday...i will check that out. very, very pretty...i love dice:) in fact, i collect vintage game pieces when i find them. the box is perfect, too. Love those pretty black dice. I would roll them around in my hand too. Get those pictures done for tomorrow. I will see you then!